I'm a bit of a romantic, so naturally Valentine's day is one of my favorite holidays. That's a bit cliche, I know but, it's true. There is just something that is fun about treating your valentine (or yourself) to something sweet and maybe a bit frivolous. I always love seeing all the pretty pink + red fill the stores after Christmas, it makes me giddy. 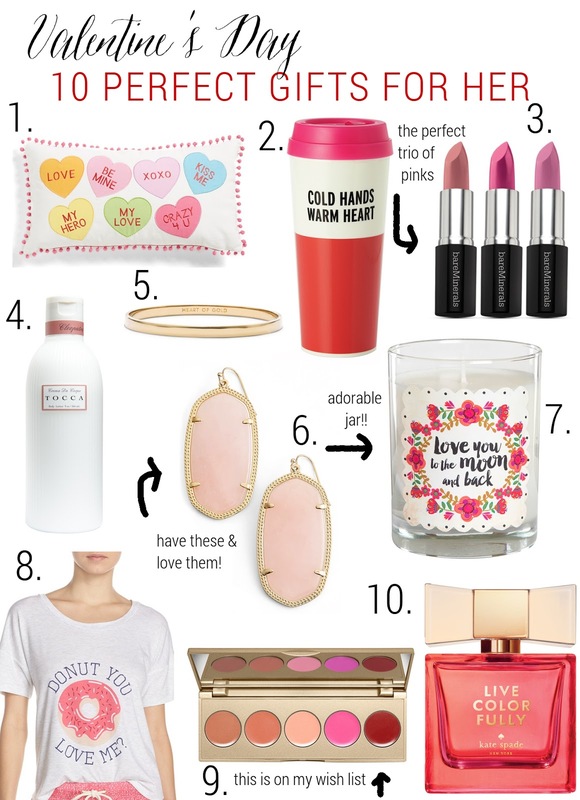 I've thrown together a few of my favs below that would be the perfect treat (jusssst in case you want give a #HintHint to your boyfriend/husband, or have been on the hunt for something to treat yourself)! I agree, there's just something so fun and cheerful about seeing everything pink and red in the middle of winter. I love everything on this list! These are all too cute! That pillow adds the most adorable festive touch and that donut shirt is perfect! I am into lipsticks in all shades for valentine's they add that perfect touch! I'll take one of each! Such great picks!